What's in a name...: Merry Christmas! To all my smexy brothers and friends, have a wonderful Christmas! Stay sexi, stay safe n don't get too drunk =~.^= Hugs, kissies n licks! ps. 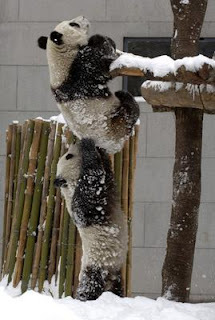 thought i'd share with you dis pic of 2 pandas playin in da snows....sooo cute!